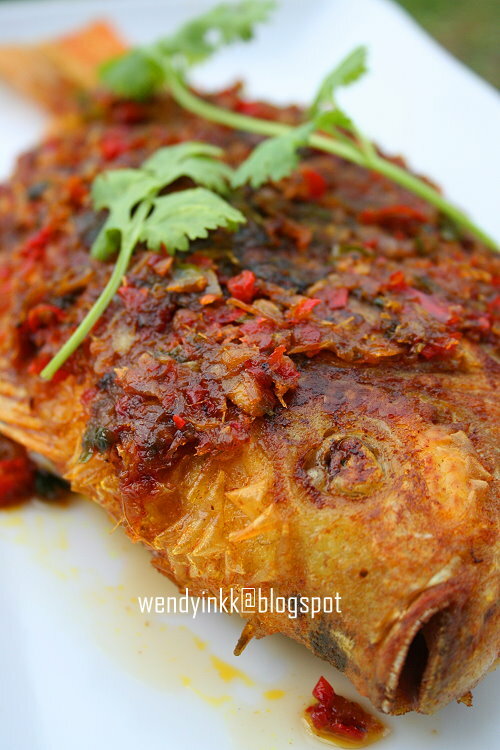 This is another favourite of mine of the Minang cuisine! 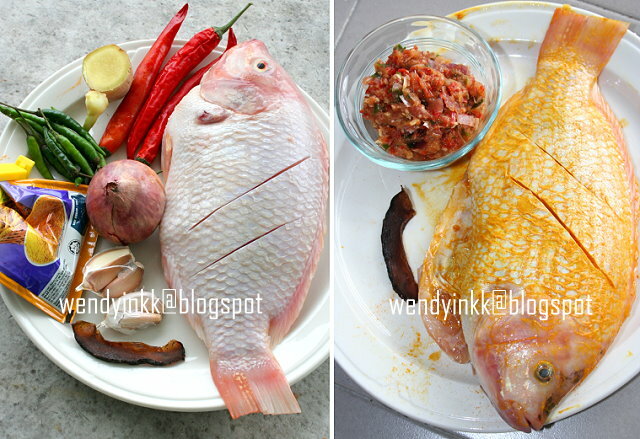 Normally ikan keli (catfish) and Tilapia is used, but then again, any fish can be used. Maybe these 2 fishes are more affordable. But catfishes are more 'buttery' compared to Tilapia. Whenever I see this dish being available at Padang Cuisine Restaurants, I can't help but take one. I must take one, LOL. I chose to use Tilapia for this dish as I am very fearful of cleaning the catfish. They are sold whole and live, usually. I know some may sneer at the thought of Tilapia. Well.... I sneer at them too, if they are farm raised in ponds. After staying here for almost 6 years, my perception of Tilapia has changed. From a muddy soggy fish, it has become a tender firm fleshed fish that one can flake with the fork. You can't put the pond raised ones and river raised tilapia on the same level, it's not on the same par. The waters in the river move, the fishes have to fight the currents and the microorganisms that causes the muddy smell in the fish doesn't exist. It can't be compared with other expensive freshwater fishes but for the affordable range, it's quite good, provided they are river raised ones. It's a fish that I can buy whole very often. If I'm lucky, I get wild Tilapia. 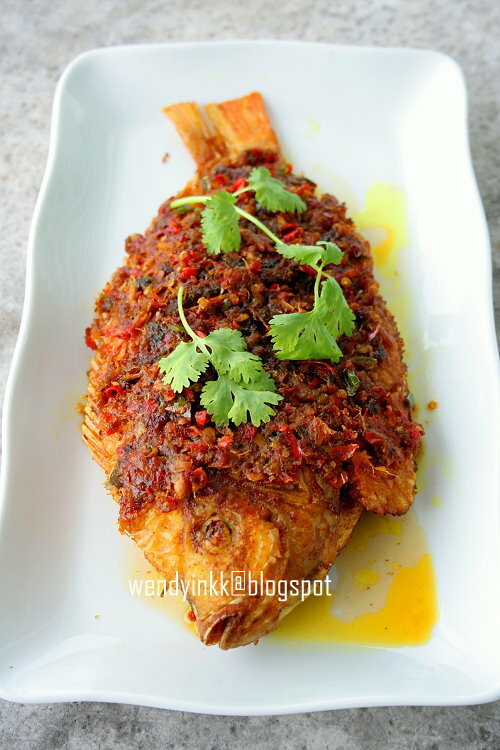 For this recipe, you can use any fish you like and make more or less of the chilli paste. I do find mine a little too little. Maybe it's because I pounded it instead of using the chopper to do the job. The onions could be too squashed up. I find the heat level to be on the ok side, but fiery for my hubby. It's not 'shiok' enough for me. My hubby who usually detests fried fishes, enjoyed this dish a lot. He hates how dry fried fishes are. It seems like I used a lot of oil, but it's the oil that helps retains the moisture in fried fishes. My mom always pours back the gingery oil she fries the fish back onto the fish...and my husband never detests hers. 1. Marinate fish with with salt and turmeric powder, rub the insides as well. 2. 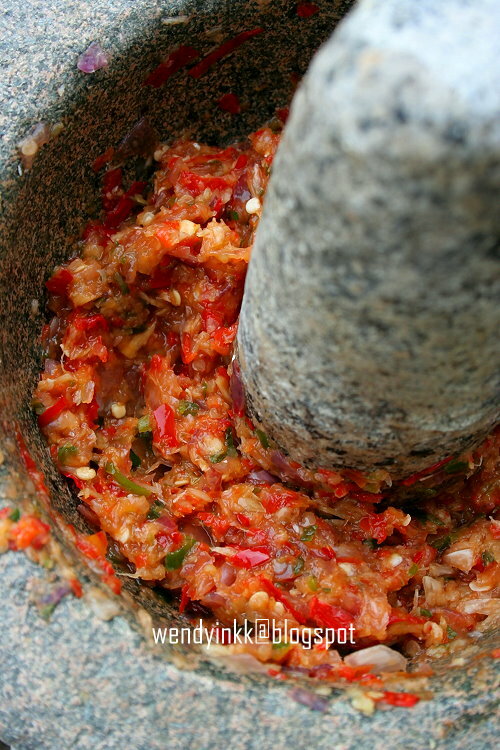 Pound/coarsely grind the chilli paste ingredients together. 3. Heat a wok on high, put in oil and put in the fish. Turn heat to medium low and fry both sides until golden and nice. 4. Lift fish out of the wok and place on plate. 5. With remaining oil in wok, saute the chilli paste and asam until it smells fragrant and looks glossy. Taste and season with salt. 6. 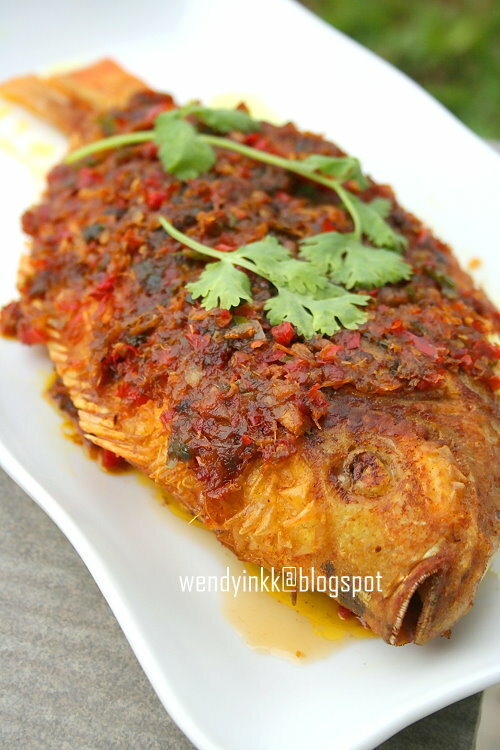 Smeer the cooked chilli paste on both sides of fish. I just bought a few pieces of spanish mackerel thinking what should I cook with it. Well cooking this today. Thanks for sharing. I like this very much! Mesti cuba! Asam gelugor is to give it some sournessa very mild one in this case. Chilli sambals are always enhanced with some asam in Malay cooking to bring out the best flavours. Dear Wendy ...asam gelugor same as asam keping or can i just use asam keping? I recommend that you double the chilli and onion.